Disclosure from the Editor: The Author received these paints as a free sample from the Golden. However, this post was not sponsored or influenced in any way by Golden and it solely expresses the opinion of the author. Many of you on the Acrylic Pouring Facebook group may have received Golden brand samples in the mail during the last few weeks. I received three Golden Fluid Acrylic samples a couple of weeks ago, and I was pretty darn excited to try them out. Golden is known for its professional-quality paints with light fastness that is beyond compare. Many of you may be starting out, and these samples are a great way to experiment with higher quality paint. I mixed this pour with some less expensive brands for a variety of colors and experimentation. Leaves no residue; film is clean, odorless, and highly resistant to water. When I first started pouring acrylic paint I used Glue-All as a paint extender, but now I almost exclusively use Floetrol because it dries smoothly and there’s less crazing (the cracking of the top layer of acrylic paint). In my pouring experience, I’ve discovered that many factors can affect a pour. Humidity is a big one for me. During the winter months, dry time is faster due to the dry heat in my home. I take that into account when mixing paints for a pour, changing ratios at times to fit the environment or season. Now, onto the supplies list. I started with a 8×8 gallery wrapped canvas and painted it with Craft Smart Radiant Gold Metallic. I then applied specks of Apple Barrel Bimini Blue with the flick of a coarse paintbrush. I love the look of strong lines and negative space, so that’s what I was going for with this piece. For the Golden Fluid Acrylics, I did a mix ratio of 1:10 paint to Floetrol to get the right consistency. I usually like to have the paint flow in a nice stream off of my stirrer, similar to warm honey. With all of the other paint, I did a 50:50 ratio. I layered each color in a single cup, using about half of each single paint cup while layering. The Apple Barrel Bimini Blue sank due to its heavier density. For the bottom layer I kept with the gold colors, to ensure a nice layer on top to complement the negative space. Does anyone else get that giddy feeling when you have all your colors layered for a dirty pour? It’s a cup of fun and mystery. 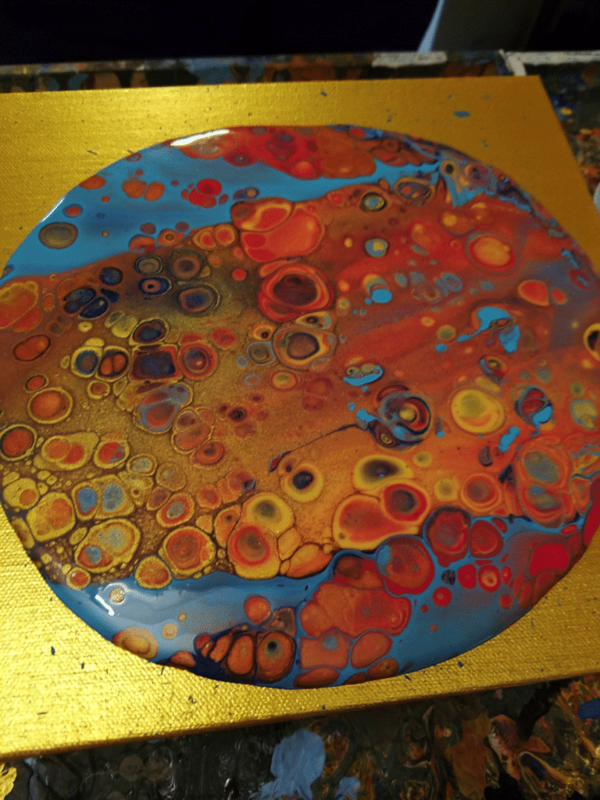 The magic exploded after I lifted my dirty pour cup, and the colors came out gorgeous. Golden Fluid Acrylic paints have such nice hues, although this can be achieved with budget paints as well, at a different ratio. 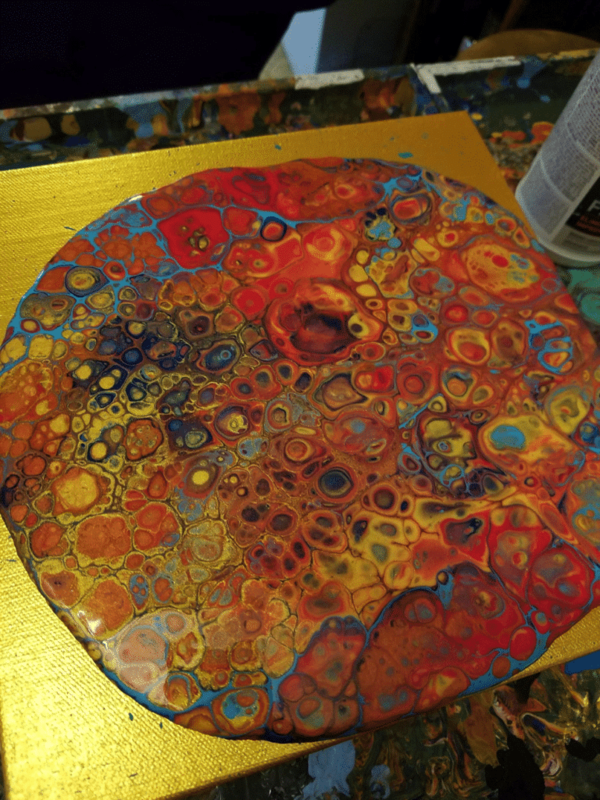 I noticed in my pour that with the Golden Fluid Acrylics I used less paint compared to the bargain paints I’ve used in other pours. 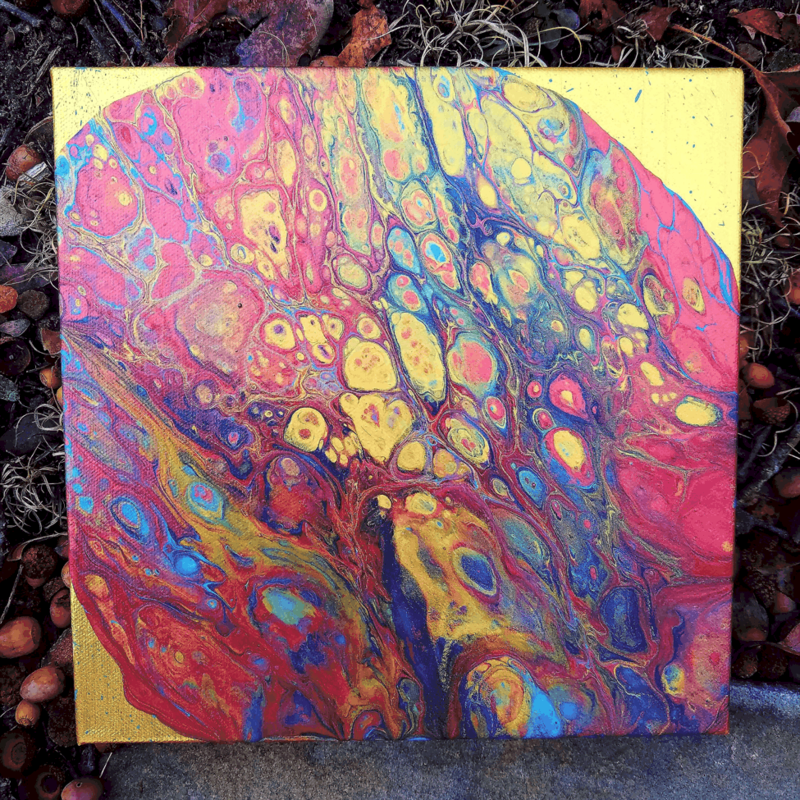 In the end, it may even out in cost to use Golden Fluid Acrylics, because of the need for an increased amount of the bargain paints to achieve the same vibrant colors. The Golden paints mixed well with the other paints. 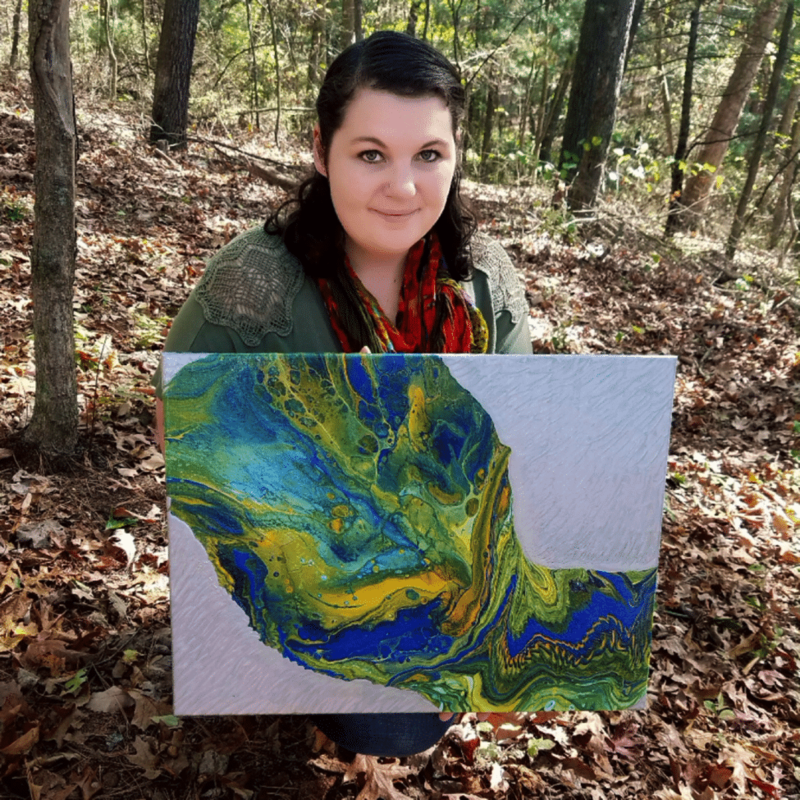 In my experience, sometimes metallic paints can take over a pour, but this product did not. A little goes a long way with these, so a large bottle will last for a lot of projects. No torching is necessary, but I love it when the cells populate immensely, so I decided to use my heat gun. After hitting the piece with a heat gun, the cells became wildly populated in a glorious way. Some specific observations about these paints: Primary Magenta really took over, while Golden Prussian Blue Hue took a back seat. This may have been because of the density. (I would suggest checking out Golden’s paint density list pdf when planning.) The Golden Iridescent Bright Gold (fine) was more vivid than my Craft Smart Radiant Gold Metallic. The two golds did come together well, but as I moved the Golden brand gold, it dissipated over the other colors. This could possibly be due to how fine the pigment is in that particular metallic paint. 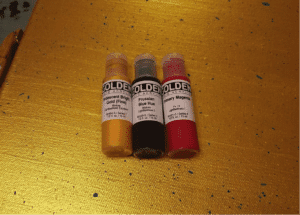 Golden has made Fluid Acrylics readily available in just the last couple of years. These are my own observations of their Fluid Acrylic line. All in all, I would recommend these paints for your next acrylic pouring adventure. Happy pouring, my friends! Alisha, Loved your pour and description! Thank you. Just wondering if when you said “For the Golden Fluid Acrylics, I did a mix ratio of 1:10 Floetrol to paint to get the right consistency,” if you meant to say 10:1 Floetrol to paint, showing that you used 10 parts more Floetrol to the 1 part paint because the paint is so intense. Thanks!! Yes you are correct June. Thank you for pointing that out to me. I will do a quick edit to be clear. You said your recipe was 1 part flotrol to 10 parts golden paint. Is that correct? Seems like a lot of paint. Thanks for the question Barbara. It is 1 part Golden Fluid Acrylics to 10 parts floetrol. 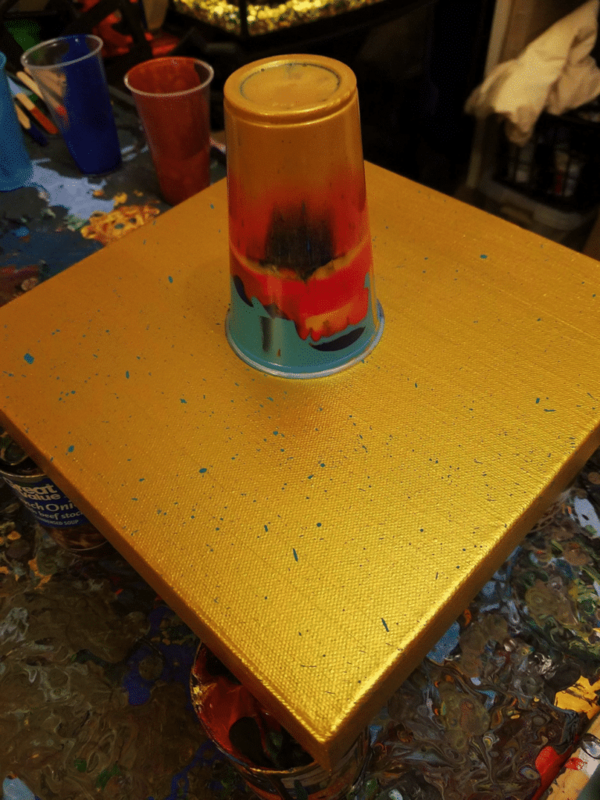 You can experiment with higher volume of the Golden Paint for a more intense color. For this pour the 1:10 ratio worked well.